I had a bit of plan jotted down on my phone. Have to meet these folks and those folks, would like to hear this room and that room. But as I road up in the elevator to the smaller show rooms I ended up just trailing the first group of folks exiting the elevator. Â You think they noticed they were being trailed by a zombie? 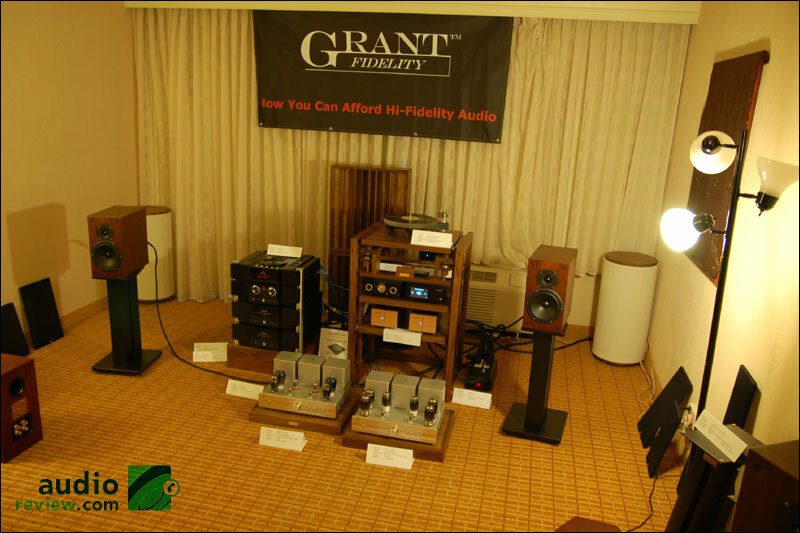 I quick found myself in room 9000, Grant Fidelity. 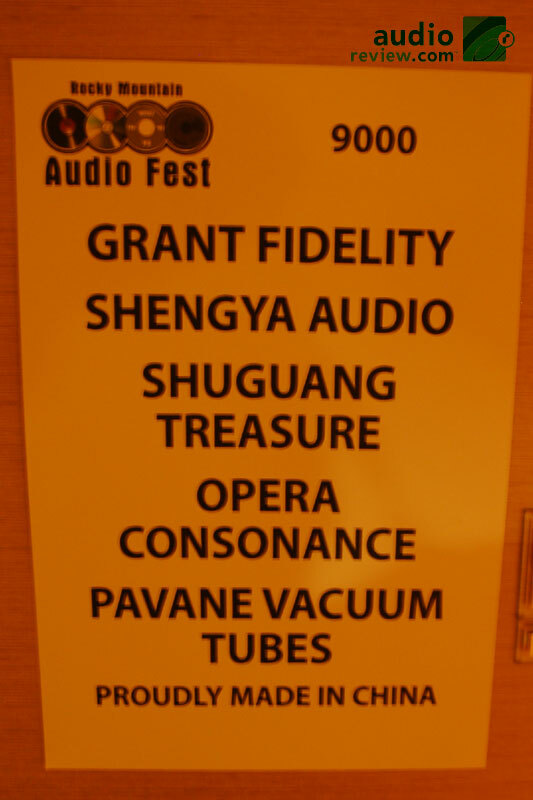 Â Grant Fidelity proudly manufacturers good sounding and reasonably priced gear in China. Â And I think that is a good thing. Â One topic I talked at length on with Gary Alpern while we were riding the SuperShuttle back to Denver airport was how theÂ extravagantÂ costs andÂ snobbishnessÂ is, combined with other issues, killing the future of hi-fi. Â Grant Fidelity, along with a few others, JoLida, AVA, Zu, Tekton pop into my mind, are great exceptions to this rule. Â And Grant Fidelity’s gear sounds good. Â Pretty dang good for the cost. Â The sound, at least in this room, was warm without being too thick in the midrange, detailed, dynamic in both the highs and lows, and enjoyable to listen to. Â Check out Grand Fidelity’s site. 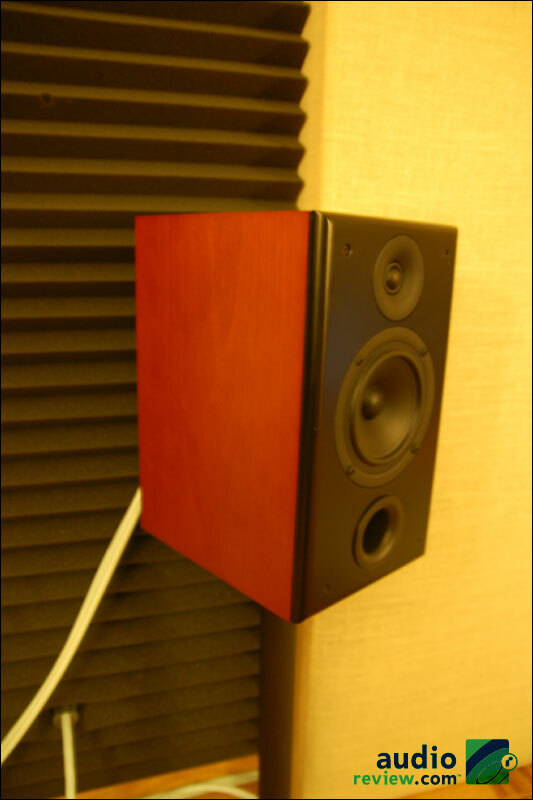 The Opera Consonance LP6.1 (LP6.1 product page) sat beautifully a top the rack. Unfortunately I didn’t get a chance to hear it but at $1,325 and with the specs it might give my Rega P3/24 a run for its money. 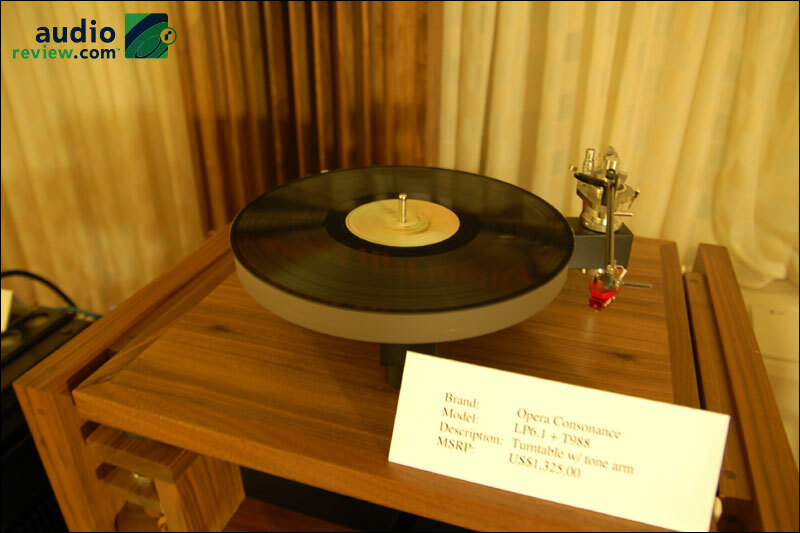 Â If you’ve had someÂ experienceÂ with this Opera Consonance turntable or others please let us know how it sounds. Â Use the comment section below. Those are some monster 8″ woofers in those little bookshelf boxes. Â At $950 the M-200A look very nice. Â The floorstanders are the M-700A Vifa and they retail for $1,250. The tag in the photo here is wrong, but I wanted to mainly show you the finish on the speakers. Â If you are dark brown finish type of person, these appeared to be made very well. 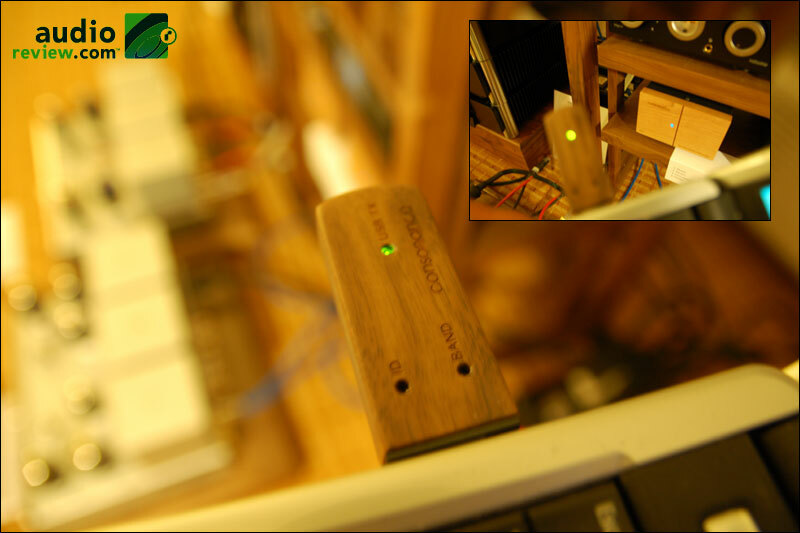 The wood cover to this USB WIFI adapter is pretty slick. Â The signal is picked up by the wood faced box on the bottom shelf. Â I’m looking for info on that product. Soon after I made my way down the hall to find the Zu Audio room. Â Do know how hard it is to carry a large coffee, pen, pad, camera and tote-bag? Â I need for hands, or at least needed to wake up enough manage all this without looking like a gimp. The Zu Audio room was by far one of the best looking rooms. Â Their goal is to put the ‘fun’ back into hi-fi. Â The Madmen themed room and three piece suits they were wearingÂ definitelyÂ made this a great room to be in. 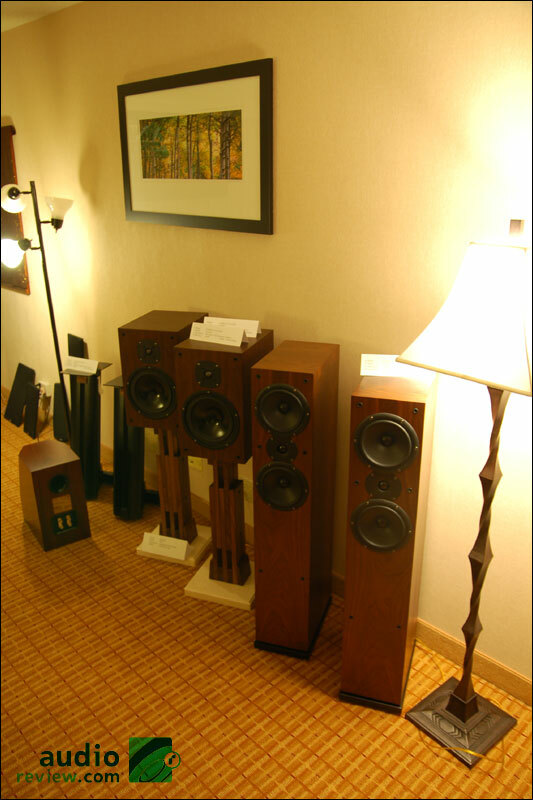 Â Zu Audio paired their Soul Superfly floorstanders (Soul Superfly product page) with Luxman and Peachtree electronics. Â Most of the music was played off a Mac into the Peachtree Nova (Nova product page). Â The Luxman SQ-38u integrated tube amplifier (SQ-38u product page) and D-38u CD player (D-38u product page) really made me nostalgic for my youth. Â My parents had gear that looked just like that, and I was never allowed to touch it. Â But I’m old enough now! Sound wise the room wasÂ definitelyÂ rock’in. Â Great punchy bass and very energetic. Â It was hard to find a spot in the room to really give them a good listen. Â They didn’t strike me as being able to render a very refined sound, but at an event like this it is hard to know if it is room, gear, or justÂ circumstance. Â I am getting the Zu Omen speakers in for review though. Â I amÂ definitelyÂ planning to have some ‘fun’ with them. 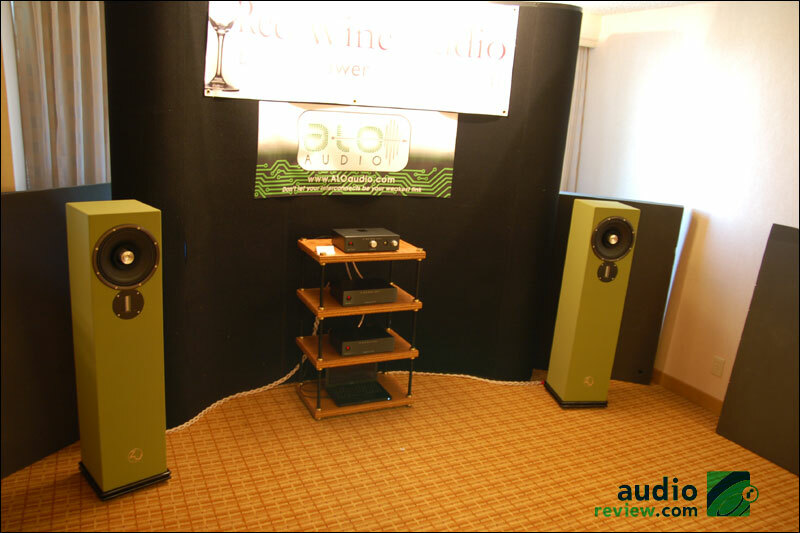 Red Wine Audio paired their electronics with Zu Audio speakers. Â Red Wine Audio makes battery powered components. Â These are very interesting. Â The battery power allows for a very quiet noise floor andÂ instantaneousÂ power. Â When listening I’d have to agree there is a veryÂ respectable black level. 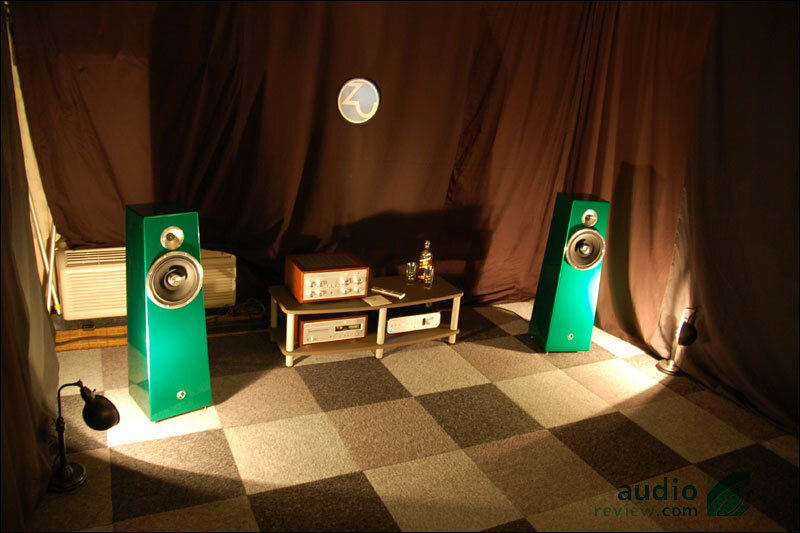 Â The Zu Essence (Essence product page) use a ribbon tweeter and are more refined than the Soul Superfly speakers. Â Vinnie Rossi, the owner of Red Wine Audio, was one of the few people to actually dare to play some interesting music. Â We listened to some electronica that reminded me of Autechre. Â My impression of the system was that a good clean and fast sound was achieved, as well as being more refined and detailed than than the Soul Superfly speakers, but there seemed to be a lack of bass. Â Especially for electronic music. Â Who knows why for sure. It could have been the room or could have been the gear. Â I’d have to have the stuff in my own listening room before I could make any real statement. The Red Wine gear was the Signature 70.2 LFP-V mono blocks (70.2 LFP-V product page) and Isabella LFP-V tube pre-amplifier (Isabella LFP-V product page). I’ve know about SjÃ¶fn HiFi (http://www.sjofnhifi.com/)Â for a while. Â I remember some AudioReview forum member had recommended their speaker cables, so I have been checking in on their gear for a while. Â This year though they are making their own speaker called The Clue, and OMG does it have bass. Â These tiny little bookshelf speakers put out some extremely deep bass. Â Sometimes it seemed too much, but it wasn’t coloring the music. Â If there was no bass in parts of the song, there was no bass from the speakers. Â But when it kicked in, it really went low. Â They retail for $999 and are going to be included in the AudioReview sub $1000 bookshelf speaker series. Â So I will be reviewing cabling from Sjofn as well. Â I can’t wait to hear The Coup’s Party People on these. Great comments on (the clue). A bit of a clarification, because the photo of the poster is a bit ambiguous. 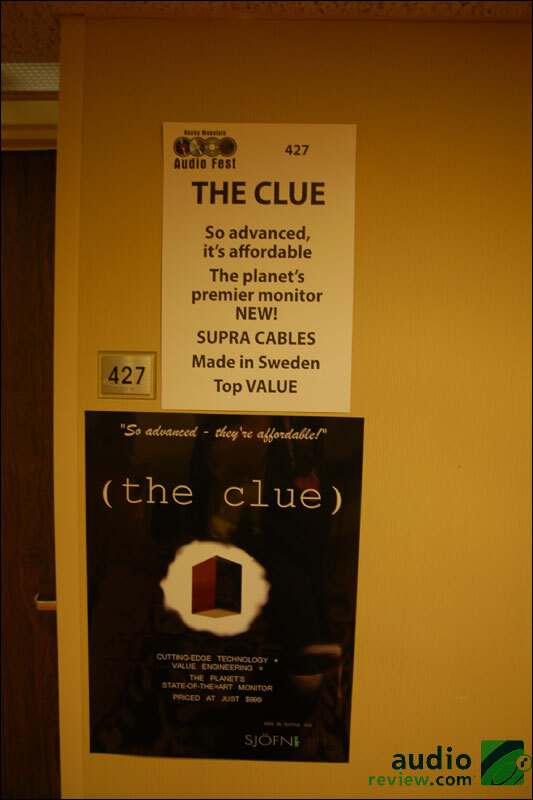 The Clue is designed and built in Seattle, WA, not as the poster might be read to suggest, in Sweden. The woofer and tweeter are both Scanspeak, with designs proprietary to Sjofn HiFi. And interesting comment about the bass extension. 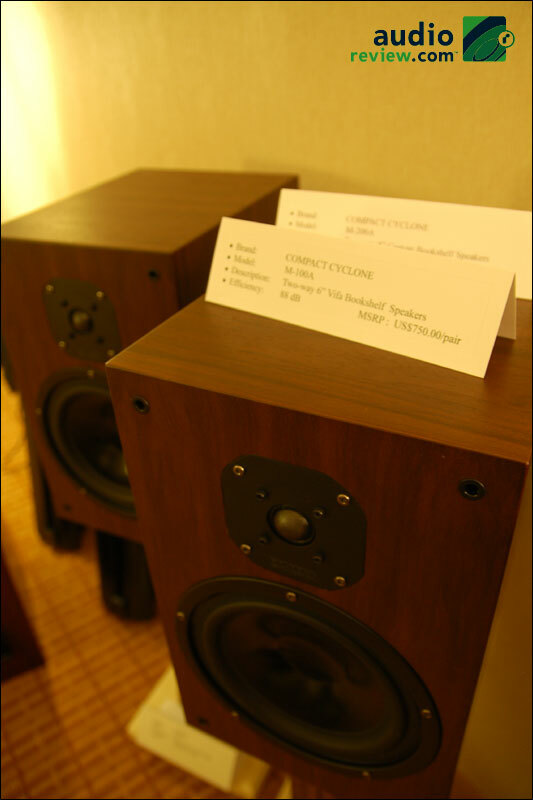 All weekend folks were coming in the room and did a double take when we put on a disc with a bit of bass demonstration. As I chatted with folks, my conclusion is that the bass extension when mated to the subdued visual presentation of this new monitor, created a bit of a non-sequitur in peoples minds. That is, it’s a “how can that little speaker put out sound like that” effect. An easy conclusion could be that the bass extension is a “trick” and that the sound is somehow less than accurate. Of course, the kicker is that this little monitor puts it out and is clean, accurate and fast! So, this is a perfect example of our senses tricking us to believe that the monitor can’t be doing what it sounds like it’s doing when, ACTUALLY, it can and does! If there are questions about this great new design requiring a good bit of technical talk, it’s best to contact Lars through the sjofnhifi.com website.